Agneta Norberg and I take the train in the morning from Stockholm to Oslo, Norway on the final leg of my trip. This morning we flew back to Stockholm from Kiruna. Last night I spoke to 60 students from the "space high school" and about 15 members of the community at large in Kiruna. Can I say blown away? I was due to the amazing response the students had to my talk. They were wide-eyed and listening as closely as anyone ever has. It was one of the most important talks I've given in my 25 years of working on space issues. Their questions were excellent. The school is a special institution that brings top students from across the country to Kiruna to learn about space and then work in the field. Some good things will come out of this talk for sure. Today we went for a tour of the Esrange space center outside of Kiruna. They maintain that it is all civilian - the same way NASA does - but we have learned over the years to dig below the surface and we are digging. Before leaving Kiruna today we stopped at the world famous ice hotel for lunch. Each November they build the hotel from huge chunks of ice taken from the nearby river and tourists come from all over the world to stay in the ornate hotel. 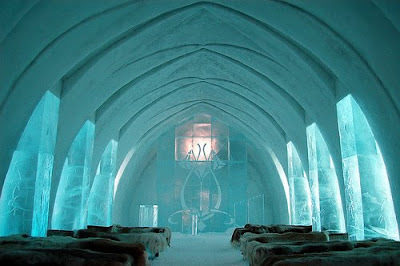 People sleep on reindeer furs and inside of artic sleeping bags and pay about $200 a night for the chilling experience. Each year new artists are brought in to create the ornate interior of ice. In the spring the hotel melts. Agneta took me to a Turkish family's house in Stockholm for dinner this evening where we were treated to a wonderful meal and then I heard the horrible story of the military coups in Turkey during the 1970-80's that forced many progressive activists there to flee the country as thousands were killed by their government with the full support of the U.S. military. Our host described how the Turkish Social Democrats sat back and watched as their hope for real democracy was crushed by the para-military Grey Wolf dead squads used by the dictatorship to do much of the killing of those from the left who were protesting in the streets. There are quite a number of Turkish refugees in Sweden and Agneta, who is 70 years old, has befriended many of them and has gone to Turkey several times and witnessed entire towns that were wiped out just for having stood against the military government. When I asked our host to reflect on what more they could have done at the time he said the people did not fight back hard enough. It's advice we could use today as we see democracy slip away from us in the U.S.